Tonight Emily and I threw a Sports Movie Night for our friends. I finally received both “In Deep” and “New World Disorder 9” on Blu-ray from Matchstick Productions. Chris, Hartz, Emily and I in September decided we’d rather save the money on driving to Portland for the crowded movie premiere and instead wait until I got it on Blu-Ray and could watch it on our big screen with loud speakers without people’s head’s being in our view. No pictures from the night but Aaron, Kelly, Chris, Tiffany, Kya, Ben Nielsen, Nate Meehan, Alex Knapp and Killian all came over for the movie with Kevin showing up really late with his surf films later in the night.. and hammered.. ha! We started off with the Mountain Biking film which nobody had seen yet then at 8 put on the ski flick “In Deep” which was amazing. They had really great music and the Shane McConkey tribute section with Pennywise playing was amazing. 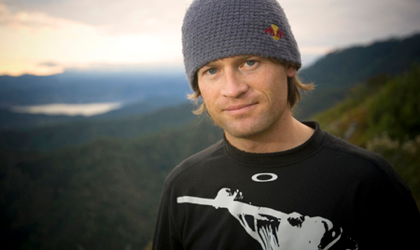 His death truly was a great loss to the skiing community as was Doug Coombs a few years back. Why do the great ones always fall..? Shane’s photo is at the top of this entry. He was killed ski base jumping where he pulled a smooth double back off a cliff but had trouble releasing one of his skis. When he finally did release it and right himself he was out of time. It was sad hearing the voice of his friend get choked up telling about it. Emily had a soccer game so when she got back we replayed the 2nd half of the film for her. Everyone had a really great time and enjoyed all the films. Later in the season Emily and I will again have to have another sports movie night to get people stoked up to get out of their freakin’ offices and enjoy the outdoors of the beautiful Pacific Northwest! Thanks for hosting Jon! I had a good time, but it was hard to return to my tiny old school TV after watching at your place! Like I said, I could have watched your TV from my house and it still would have been clearer!! !